If you missed this year’s March for Jesus, you missed a miracle of God. All weather channels were forecasting rain and thunder showers all day, and as you may recall the days leading up to the march were filled with heavy rain. We woke up in the morning looking at the Calgary Sun weather forecast and prayed, “God the weather is under your control. If it’s your will, you can push the rain back, you can give us an open window with open skies as we march.” We know that many other believers were praying for that miracle to happen. When we arrived at the gathering point, at Millennium Park, the whole sky was dark. We received a call from the company we rented the bouncy houses from and they told us that it was raining everywhere in the city of Calgary. They asked us if we still wanted the bouncy houses to be set up. We said “yes, by faith, God will move the clouds for the March for Jesus”, and here is what happened. A very strong wind came from the North, pushing the clouds away from the march. So for the entire march, God truly opened the skies and blessed us with sun and an awesome time of worship, praise and prayer. God proved once again, that He is the True and Living God, the maker of the heavens and the earth and that there is no God like Him. There is something truly amazing about marching and worshipping publicly with thousands of fellow believers, when the Holy Spirit is invited and when He shows up. Joy and laughter, dancing, shouting and waving does something to your spirit that makes you even more proud to be called His son or daughter, a child of the Living God. 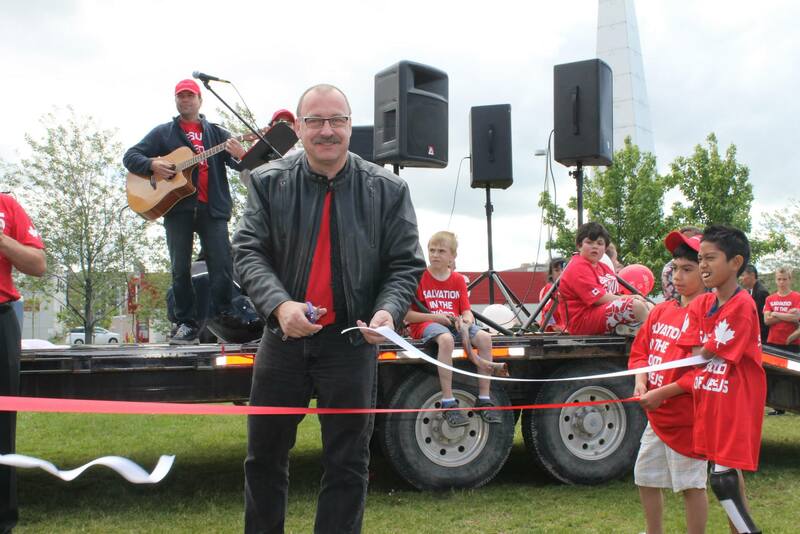 This year, God had a special treat for us; as Lawrence Irwin and Jim Blake held a Canada ribbon across the entry point to the march and Rod Taylor, the Deputy Leader of the Christian Heritage Party, cut the ribbon, officially opening the March for Jesus 2011. What a blessing to have Christian representation from the political arena. It is so rare to see “Christian” politicians publicly confessing the name of Jesus Christ without shame. Another special surprise from our King of kings showed up at this year’s march. Here’s how the story unfolded… There was a pastor from Miami, Florida who heard the Lord speak to Him, “there is a march that is going to happen in Calgary, for Me. I want you to get a banner and organize a plane and a pilot to lift my name high over Calgary.” Then, there was a little Spanish church in Calgary, that took a call from this pastor in Miami, and took the call from God, and worked with the Miami pastor to make it happen. The Calgary church paid for the plane, and as a result the City of Calgary was blessed with a banner flying high over head which read “CHRIST IS COMING BE PREPARED!”, during the time of the march. In this year’s march, we felt a lot stronger spirit of joy. It felt like all of heaven was rejoicing with us and the joy was very tangible. There were flaggers who were really having a wonderful time with their colourful flags. You could tell from the expressions on people’s faces that they were elated as they danced and sang down Stephen Avenue Mall. We were also blessed with great moments of prayer at the stops along the march route. Not only were Christian leaders from Calgary praying, but a pastor from England, Johnson Paul, whom the Lord picked out came and gave a powerful prayer which rocked the heavens. It is so precious when God brings people from distant places and hand picks them to bless His people with prayer, testimony and power from the Holy Spirit. Toward the end of the march, just before entering Olympic plaza, the flaggers, organized by our precious sister Darlene West, lined both sides of the street and leaned the flags inward allowing the marchers and the March for Jesus truck to pass under and through the flags. Darlene said that she had this vision of a royal entry for King Jesus. At the moment when we entered under the slanted flags, there was such power from the Holy Spirit, such an amazing rush from God that it was truly overwhelming. It was really hard to hold back the tears. At those moments, you know that something truly special is happening. With the beautiful weather we received, from God, for the entire march, we then entered into post-march celebrations at Olympic Plaza. We were really pleased to see a lot of young people, the new generation, at the march. We were also blessed that sister Esther Arbour brought a group of young native kids down from a northern Alberta reserve to march and worship in the march with us. One day, those men and women will lead the way and pave the road for future generations of believers. At the March for Jesus, the last couple of years, we have seen that the call to action has been taken up predominantly by the ethnic and immigrant churches of Calgary. It looks like the “outsiders” coming to this new land, are willing to advance the Kingdom of God and take possession of all of His promises, not just the four walls concept, but the whole promised land. Praise God. May the Lord touch the other churches and set them on fire for God’s Kingdom and His glory, may He release them from their four walls into the streets and give them a spirit of evangelism, to turn cities and nations upside down for Jesus. God, through the March for Jesus, is extending an offer of new wine skins for all, in which He desires to pour out His new wine. Some people are standing up and receiving the new wine skins, others feel that they have to hold on tight to their old wine skins. God warns us that He cannot pour His new wine into our old wine skins. If we want to advance with God, no matter what our age or background, we have to be willing to let go of the old and dry skins, in order that we can receive what is fresh and new from God. After arriving at Olympic Plaza, God extended His mercy for a little longer and the weather held off for our group prayer, for the nations, and for some initial proceedings. But then wanted to test our staying power. He wanted to see if we would be steadfast and worship, pray and celebrate under harder conditions, so he sent a down pour of rain to test our metal. We were so impressed at how many people did not just run away due to some unsavoury weather, but stayed, and the worship continued. We were overjoyed that once again, the Lord compelled us to hold the March for Jesus on Father’s Day. Father’s Day, what a perfect time to bring our God into the forefront, where we can bring our earthly fathers and where they can be touched by our Heavenly Father. For example, Artur Pawlowski’s father and mother came to the march, and they are not believers. What came out of his father’s mouth is hard to believe. The spirit of purity and joy was so strong, that when Artur’s father looked at the crowd, with tears in his eyes, he said that this was one of the most beautiful things he had ever seen. Artur’s mother, later on, said that they both had to hold back tears because, “something was touching our hearts”, and we know that, that something was the Holy Spirit, with His amazing love, touching the depths of their souls. When King Jesus shows up, among thousands, that truly love Him and are not ashamed of Him, His mighty hand is at work. He touches not only those that are participating, but all of heavens blessings are poured out for everyone to experience, even those looking on. Our point is this; bring your earthy fathers, bring your mothers, bring your relatives, bring your neighbours, bring your enemies, to the march for Jesus next year, so God can touch them and change them. There is no greater place on the face of the earth to honour your father on Father’s Day then at the March for Jesus and if they are not believers maybe, just maybe, they will be when they taste of the Lord. Speaking of our enemies, there was a man who walked along side the march who held up a home made sign which said, “GROWN UPS DON’T NEED IMAGINARY FRIENDS”. He was openly, boldly and loudly expressing his view that our mighty God is merely a figment of our imaginations and that as “grown ups” we should put our childlike beliefs aside and embrace the reality that this is a meaningless life with no grand design or purpose. Some might think that a heckler like this would put a damper on our festivities, but we were overjoyed to boldly proclaim that we are not ashamed of the gospel, for it is the power to save one from his sins. What a great opportunity, that God would make a way for this man to come and would give us the chance to preach to him, to pray for him and to bless him. We also invited him to come to the plaza to enjoy a feast from the Lord. This young man, in a short period of time, encountered countless people that were not cursing him, not calling him names, but were simply blessing him and loving him, even though he was mocking. What a day. We will cherish those moments forever and we are sure that in eternity we will be able to remember the overwhelming joy of marching for our King Jesus on this earth. The weather, the signing, the dancing, the flagging and also all the prayers that were given up by church elders. Those elders represented many nations and tribes and tongues and we were told by many that those prayers, during the march and at Olympic Plaza, touched them very deeply. They were more than prayers, they were prophetic declarations, by faith, that this city, this province, and this country will be able to hear and experience the love and mercy of Christ. What also touched us deeply was the dedication of all of the volunteers, whose hard work, love for people and unselfish desire to serve God and others made this day so very special. Without those dedicated people, without those true heroes of the faith, such moments would not be possible. To all of you, we say thank you, and we pray that God will bless you, keep you and protect you. One day, we are sure that we are going to sit at the Lamb’s table rejoicing at how our Lord found us worthy of participating in lifting His name high for all to see. You volunteers truly have the spirit of servant-hood and that is what makes you great in the Kingdom of God. Your hard work is written in eternity and your rewards await you. Through the year of organizing the March for Jesus 2011 some asked us, “Why march?” To that question, we simply say, “Why not?” Every army marches. God’s army is no exception. As we leave the March for Jesus 2011 with wonderful moments and countless special memories of the day, we are already looking forward to next year’s march. June 17, 2012 is the day, next year, that we invite you to help us to make that march, for our Lord and our King, even better. For that, we need all the help we can get. Please participate. Please visit the website at www.marchforjesus.ca. We will be updating it with new movies and pictures, etc. Also, we ask that you would keep the financial needs of the march in your mind and in your prayers throughout the year. There are still a few remaining expenses to cover off from this year’s march and then of course preparations and costs getting ready for next year. There is a donation form on the website for all who are willing to help. Always remember the woman who gave the mite, Jesus made it clear that her contribution was great. We appreciate whatever you can give to help cover costs. We are excited about the many requests from different cities to assist them in organizing marches, and we will need resources in order to complete this work. Please keep this in mind as you give, since you will be helping in planting seeds of the gospel, not only in Calgary but in other cities as we help them organize. In just a few days we are going to March for Jesus on the streets of Calgary. June 7, 2014 Artur Pawlowski Comments Off on In just a few days we are going to March for Jesus on the streets of Calgary. October 12, 2018 Admin Comments Off on Stay connected with us and please Subscribe to Our Channel! The Shaking of Jehovah, God speaks to me on Canada day! July 15, 2008 Artur Pawlowski Comments Off on The Shaking of Jehovah, God speaks to me on Canada day!